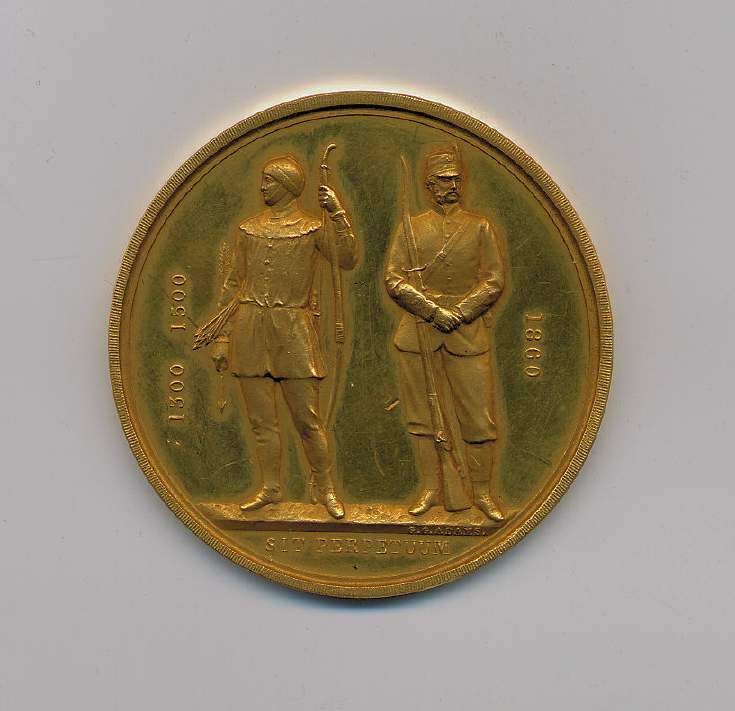 Circular gold metal medal (a) with the emblem of the National Rifle Association on one side - two figures, one holding a bow and arrow, the other a rifle - with the motto SIT PERPETUUM and dates 1300 1500 beside the bowman and 1860 beside the rifleman. On the reverse is a laurel wreath with THE NATIONAL RIFLE ASSOCIATION 1860 in the centre. The medal fits into a square presentation box (b), which is covered in purple velvet with a gold border. The base of the box is lined with purple velvet and the lid with cream silk stamped with the name of the maker C C ADAMS SCULPTOR LONDON.. I have this medal in what appears to be Silver. The backside of the medal also says "1860". Is this the year the medal was presented, or simply referring to the first year rifle tournaments were held? Should I consider insuring this medallion? This is the Gold Medal awarded to the winner of the Sovereigns Prize. The early ones are solid gold and this is the premier prize along with the gold badge and £100 presented by the reigning sovereign. See comments listed under the Gold Badge. C.C. Adams was the engraver of the first medals to a design by G.G Watt, the famous painter. The Artist Rifles was formed into the Rifle Volunteer Movement and had their own Companies.. They subsequently became the SAS regiment.